This is a recipe that has been a favorite around our house for years and only gets made once in a blue moon now because fresh crawfish tails are hard to find around these parts of the eastern seaboard. Frozen crawfish tails from China do not compare to the intense flavor and texture of Louisiana crawfish. So when Monique flew back from her trip to New Orleans earlier in the month she carefully packed into her check-in bag 4 pounds of the delicate crustacean tail meat. So we had the opportunity to make our favorite crawfish pasta dish which I named after her, Crawfish Monique. This recipe is my version which closely approximates a similar crawfish dish known as Crawfish Monica® and sold from one of the food booths on the fairgrounds at the New Orleans Jazz & Heritage Festival every year, which is affectionately called “Jazz Fest” or “The Fest”. It is sold by the New Orleans Chapter of the American Culinary Federation (ACF-NO), and still makes up their major annual fund raising event for the organization and the local culinary apprenticeship program of Delgado Community College. A commercial version of the sauce can be bought by Kajun Kettle Foods, Inc. and is also the provider of the sauce for the annual sales at the Jazz Fest. Pete Hilzim is the owner and operator of Kajun Kettle and I worked with him on various projects during my early years as a chef in New Orleans. Specifically he recruited me to assist with local benefit dinners and concerts supporting the group New Orleans Artists Against Hunger and Homelessness (NOAAHH). In 1984 I was in the middle of my second semester of the culinary apprenticeship program at Delgado and as part of our class credit we were required to work at least one day at “The Fest”. After convincing Chef Wolf at the Hyatt that I needed a few days off from the banquet kitchen I ended up working three days in a row from Friday to Sunday, (you got into the festival for free if you worked it) and having attended as a festival goer for many years this was my first time as an inside worker. I remember the ACF-NO president at the time was the Executive Chef of the New Orleans Hilton Riverside Hotel, his name escapes me, but I remember him telling me if I ever needed a job to call him, I think he is retired, and I have a secure job now. 1. In a large saute or sauce pan add the heavy cream and bring to a simmer. Using a wire whip be sure to stir the heavy cream to ensure that it does not boil over the top of the pan. 2. As the heavy cream is simmering whip in the chicken base, Cajun spice blend, L&P Worcestershire Sauce and the Crystal hot sauce. Continue to simmer and whisk the heavy cream to thicken and reduce a bit. 3. 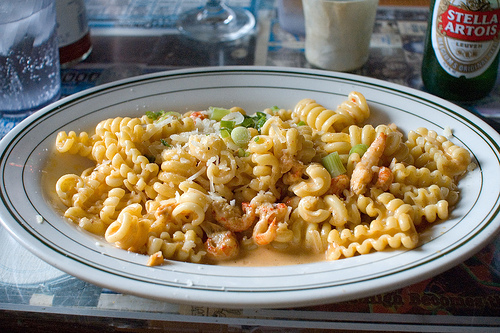 When the heavy cream has the sauce consistency to coat the back of a spoon fold in the crawfish tails and then fold in the pasta and continue to heat through until all ingredients are warmed and the sauce bubbles a bit. Stirring often to ensure even heating of all the ingredients. 4. Toss in the chopped green onions and fold them into the ingredients. 5. Serve in individual bowls with the fresh grated Parmesan cheese available for guests. And a bottle of Crystal Hot Sauce on the table for guests who like it really spicy! Can I assume that the crawfish tails were previously cooked and peeled before adding to the cream sauce? Crytal hot sauce isn’t available here and I’m not familiar with it. Is it similar to Tabasco sauce, or is it thicker? Crystal hot sauce is preference because it has a milder flavor than Tabasco, but any favorite hot sauce would be fine. Yup, no mudbugs available down here. I’ll try it with some medium shrimp. No shortage of hot sauces here, I’m sure I can find something suitable. Absolutely fantastic!! I subbed shrimp because the only Crawfish we can get here is the china stuff pre seasoned to make you think you’re eating cajun. (yuck). I know I’ve told you this before but in case anyone on this site is considering it…..DO IT! Everyone who has eaten this thinks it’s delicious! 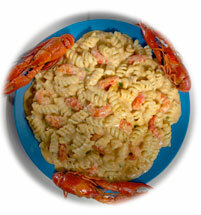 Now what recipe do I try next…..
Crawfish Monica is one of the top 5 things I miss most about living in NOLA. Thanks for the recipe!!! This looks really delicious. I have never cooked crawfish and I think I’ve had it once. This dish makes me want to try it again! Thanks for passing this recipe along and to Monique for bringing back the crawfish to you so you could do it. How did she find the population of shellfish surviving what’s been happening in the waters down there? Will they be ok and recover completely? Ok just reading the ingredients made my mouth water! Great recipe , love all the ingredients. This looks fantastic! I’ll have to do the shrimp substitution because there is a distinct shortage of crawfish tails in Utah. Hi CCR – this one definitely sounds like it’s worth the calories, and them some! Oh, my. That looks to die for. I’ve got a package of crawfish tails in my freezer just waiting for the right recipe. Now, if I stick to the diet for the next month I’ll have my reward with this recipe!